The sponsors for the IWMW 2016 help to enrich the event by funding event support, social activities and providing resources. The sponsors benefit from gaining feedback about their services and products from event participants while event participants benefit not only from the sponsorship but also by hearing about their products and services. Note that a number of brief interviews with sponsors are also available. They forge strong working relationships with their clients in the HE sector and ensure they have the tools in place to adapt to a changing digital landscape. With experts in strategy and research, user-centred design, branding and communications, development and hosting, they fuse creativity, technology and business strategy from the outset. Precedent are sponsors of the venue for the IWMW 2016 dinner, which will be held at the Merseyside Maritime Museum. TERMINALFOUR are sponsors of drinks at the IWMW 2016 dinner, which will be held at the Merseyside Maritime Museum. TERMINALFOUR sent a message to registered delegates on 7 June 2016. Indexing content across repositories and multiple formats, Funnelback provides a holistic experience for users’ on everything from official social media channels to course listings and staff directories. For more information on what Funnelback can do for your institution, please get in touch. Funnelback are sponsors of the IWMW 2016 lanyard. Funnelback sent a message to registered delegates on 14 June 2016. Digital Clarity Group is an analyst and consulting firm focused on the content, technologies, and practices that drive world-class customer experience. Global organizations depend on DCG’s insight, reports, and consulting services to help them turn digital disruption into digital advantage. Digital Clarity Group offers advisory services to business leaders, technology vendors, and service providers. Our services include technology and service provider selection, customer journey mapping, roadmap development, stakeholder management, scoping, thought leadership and custom research. Digital Clarity Group are sponsors of the event amplification at IWMW 2016. Digital Clarity Group sent a message to registered delegates on 13 June 2016. We design and build sophisticated websites for major universities, the public sector, and corporate businesses. Our professional-services team can provide an end-to-end website project from discovery through to delivery. Or, they can support your in-house teams. We design, we migrate, we build, we test, we develop, we train. Zengenti sent a message to registered delegates on 10 June 2016. WP Engine will have an exhibition stand at the event as well presenting a workshop on Debunking the Myths around WordPress on the first day. Headscape works alongside internal web and digital teams adding additional capabilities for user research, stakeholder research, UX design, information architecture, prototyping, development and analytics projects. We’ve been working with universities for over ten years providing valuable advice and support. Our advice on strategy and digital transformation is rooted in our practical, hands-on experience in designing and developing websites. In the last two years we’ve worked with universities including Edinburgh, Hull, LSE, Strathclyde and UCL and others in the HE sector such as the Higher Education Policy Institute and Higher Education Statistics Agency. Headscape are funding sponsored places at IWMW 2016. 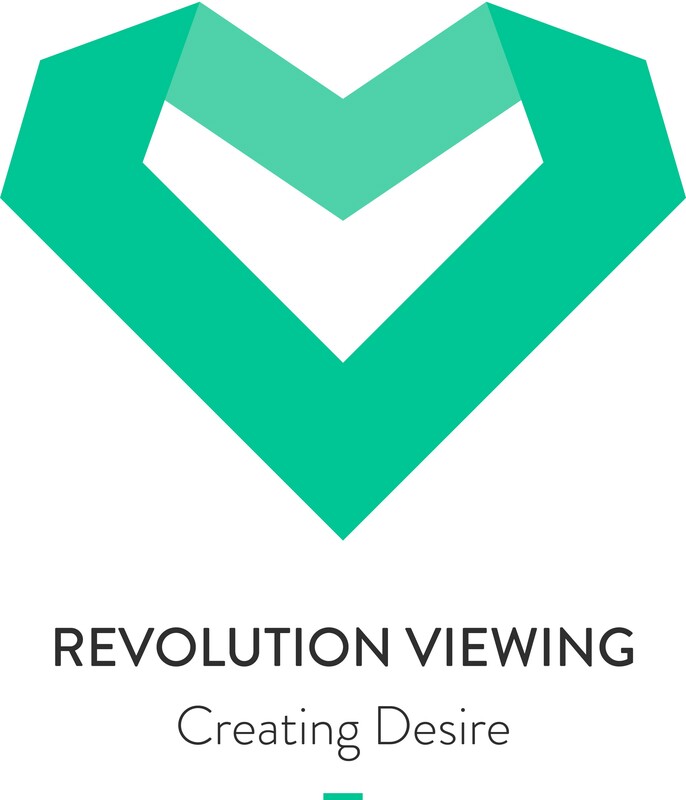 Revolution Viewing is a creative digital agency producing video and rich media content to create desire with prospective students. Our mission is to help students to select their perfect university. The bespoke, research-led, specialist digital solutions we provide have been positively contributing to university student recruitment and marketing campaigns at over 70 universities during the past 12 years. We are the most used provider for virtual open days, 360 virtual tours and videos in the UK higher education sector and the only provider able to produce this suite of solutions in-house with our growing team of digital specialists. We also work with universities to increase brand presence and to convey specific messages to a wide range of university audiences. Our sector knowledge, experience and creative approach means that we are able to quickly assess and identify your challenges and opportunities whilst delivering innovative and dynamic solutions that will help you to stand out from the crowd – it’s all about creating desire! Paul Boag is a user experience consultant, author and speaker. He helps not-for-profits such as the European Commission, UCAS and Doctors Without Borders adapt to the digital world. He has worked with over 30 higher education institutions helping them refocus on user experience and engaging with a new digitally savvy audience. Whova are the technology sponsors for this year’s event. Building on last year’s use of the Whova service (in the event feedback one delegate commented “Keep using Whova or equivalent. 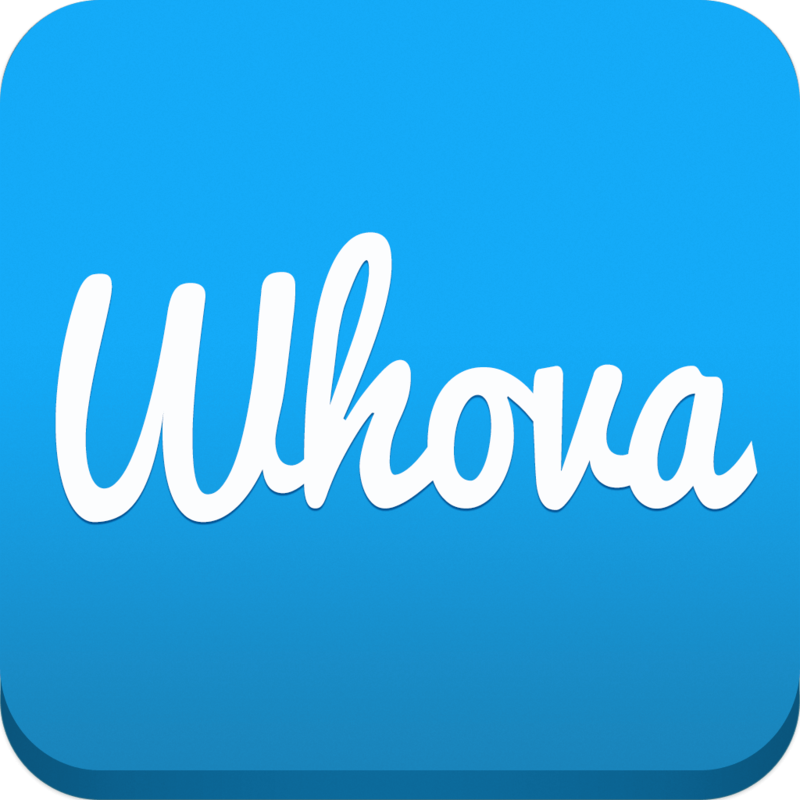 Seemed like a great networking amplifier“) we will once again be making use of the service to facilitate communications and discussions using the Whova app (available on iOS and Android mobile devices). And this year, to add a bit of fun, we’ll be incentivizing use of the service! Whova is a leading event app provider, and has powered over 3000 events in over 100 countries. Whova provides an all-in-one event app that focuses on the event engagement between all participants of an event including event attendees, organizers, sponsors, and exhibitors. Brian Kelly and Alberto Guglielmi summarise the benefits IWMW 2016 delegates gained from the sponsorship of the event amplification using the Whova app. A playlist of these video interviews is also available. A small exhibition will be provided by a number of the IWMW 2016 event sponsors. The exhibition will be provided in the room used for tea and lunch. Note that parking is not available outside the Redmonds Building. 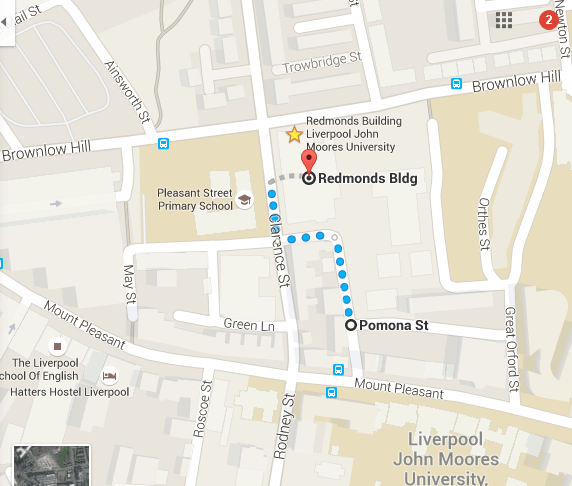 If you are delivering materials by car you may be able to park your car on Pomona St, Liverpool L3 5TL and carry the materials around the corner to the Redmonds Building, as shown on Google Maps. 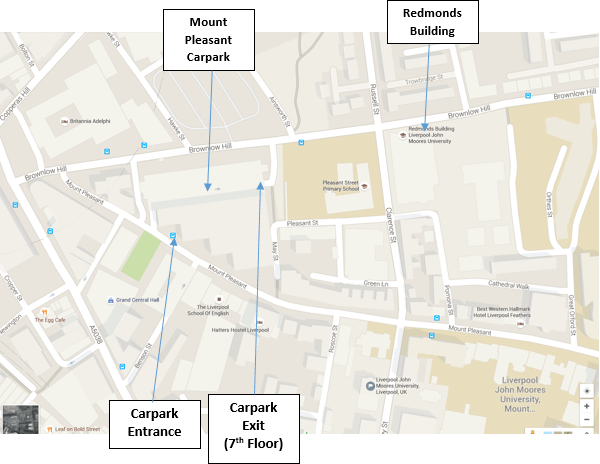 The closest car park to the Redmonds building (the venue for the IWMW 2016 event) is Mount Pleasant car park, which is a 2 minute walk. Mount Pleasant is a hill, so you enter the carpark at level 1, but exit at level 7 on the opposite side of the building. If you park from level 7 or above and leave the carpark where the car exit is, then you are next to Pleasant Street school and less that a 1 minute walk to the Redmonds building. Materials will be stored in the Redmonds Post room.